Shirt and Clutch from Mindy Mae's Market. Shaina Mote skirt. Swedish HasBeens sandals. La Mer watch. Wanderlust + Co earrings. I'm unintentionally going in a more prim and proper direction today with this plaid shirt and straight skirt combination, but I thought it would be really fun to play off the prep with gold metallic finishes, like this French-emblazoned clutch from Mindy Mae's Market. Anything metallic is like my go-to to spice an outfit up, so I have a silver and gold of everything - clutch, sandals, heels, jewels, you name it. Mixed metals are my element. 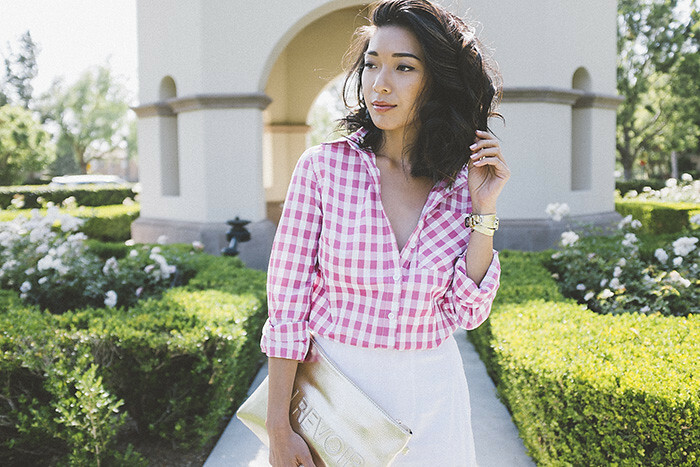 i love the gold mixed with the pink gingham. so classic with a fun metallic pop. great look! Great shoes! I like to mix it up stylistically too. Super cute outfit, I love your blouse.